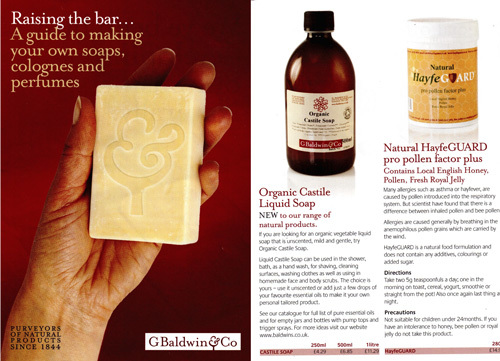 > G Baldwins & Co Purveyors Of Natural Products LOVE our HayfeGUARD Local Honey! Tim the manager of G Baldwins & Co in Elephant and Castle London was very reluctant to take HayfeGUARD as he has normal local honey for sale. He was not sure customers would take to our special local honey, pollen & royal jelly preparation. We explained just how different HayfeGUARD is to a normal jar of honey, mainly you would have to eat around 10-14 jars of normal local honey to get the same amount of pollen contained in just one pot of HayfeGUARD Local Honey. Tim is very impressed with the reaction from his clients, but he agrees that you must explain to clients the difference between a normal pot of honey and HayfeGUARD honey. If people really want local pollen for health reasons, no question the pollen concentration in one pot of HayfeGUARD is far greater. It’s better value, better results and they will thank you for making them aware of it, tell their friends, and come back for more! Congrats to G Baldwins & Co for helping to spread the word!